Last night gave us one of the most monumental 90 minutes (or so) of television ever, as the late night legend David Letterman took the stage as the Late Show host for the very last time. And yes, all the emotions were had. But just because he didn’t have any official guests (beyond Foo Fighters’ performance over that amazing montage) doesn’t mean that the show lacked celebrities. Check out the final star-studded Top Ten list below. 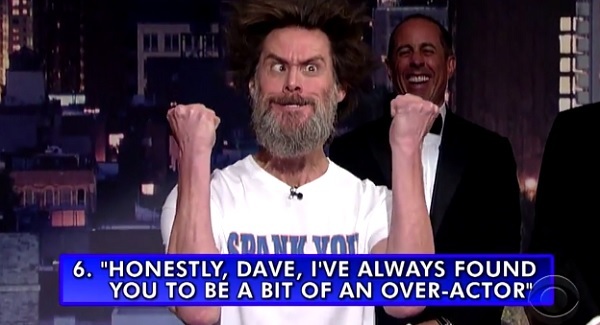 For the “Top Ten Things I’ve Always Wanted to Say to Dave,” celebs and Late Show frequenters like Alec Baldwin, Steve Martin and Tina Fey came out, with Chris Rock predictably poking fun at the Late Show producers for hiring another white guy as Letterman’s replacement. One of the highlights included a burly-bearded Jim Carrey coming out in a T-shirt and reverting back to his old rubber-face routine. From an attire standpoint, he looks so strange standing next to Jerry Seinfeld, whom Letterman picked at for being all decked out in a tuxedo. 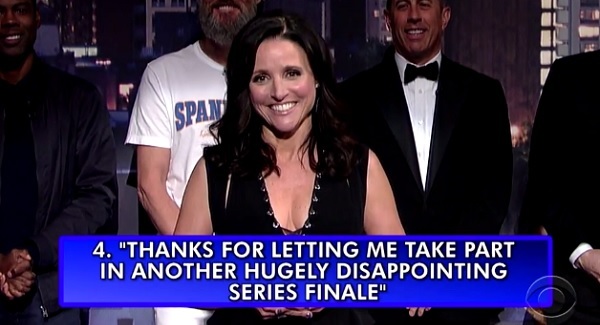 And it was Seinfeld’s former co-star and Veep lead Julia Louis-Dreyfus who delivered the best shot of the night. Everybody loves a good rip on the Seinfeld finale, right? Seinfeld and everyone else on stage seemed to. And even though Bill Murray’s item, the last Top Ten entry ever, wasn’t overly hilarious, it was still great to see the iconic comedy star return to the show for a second night in a row, after bursting from a cake in the previous episode. I assume he slept under Letterman’s desk that night. The final Late Show, which Conan O’Brien was actively telling his own audience to change the channel to watch, was not only awesome, but it was also a solid ratings hit. According to Zap2It, it brought in the highest local ratings since the 2005 episode where Oprah Winfrey and Letterman squashed their beef, and it outrated every primetime broadcast for the night. That’s outstanding. Thanks, Dave. We’ll always be here if you want to come back at some point, with far more than ten reasons guiding us.